Leticia Corona is a Global Development and Population Fellow at the William and Flora Hewlett Foundation. Leticia works across the program’s portfolio to provide strategic and analytic input. She focuses on deepening the foundation’s support to organizations advocating for access to affordable, high quality reproductive health services in the United States; and applying principles around diversity, equity and inclusion in our international grantmaking. Before joining the foundation, Leticia was the director of community advocacy at Leadership Counsel for Justice in Accountability in Fresno, Calif., where she led the groundwork for setting policy priorities and developing new strategies for investments in long-term water projects in disadvantaged rural communities in the state. Leticia previously worked with the U.S.-Mexico Border Philanthropy Partnership. She has worked alongside organic coffee producers in Mexico on projects that enhance earning power while maintaining environmental sustainability. Leticia also worked for the Whitaker and Peace and Development Initiative in partnership with UNESCO in Tijuana, Mexico, where she contributed to the development and implementation of the their programs. 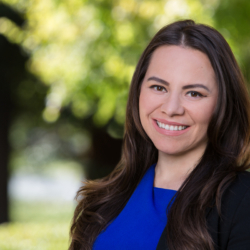 In her free time, Leticia mentors young Latinas and women of color in the Central Valley to help their academic and professional development. She is an alumna of the Hispanas Organized for Political Equality fellowship and co-founder and co-delegate for the UC Berkeley Chicanx Latinx Alumni Association, Central Valley Chapter. She is a proud daughter of immigrant farmworkers from Guanajuato, Mexico, and grew up in a small rural town near Fresno. Leticia received her bachelor’s degree from the University of California, Berkeley, where she double majored in Chicano studies and social and cultural anthropology. She also received a master’s degree in international relations from the University of San Diego.